Hero Histories: Glittering is...Golden Lad! 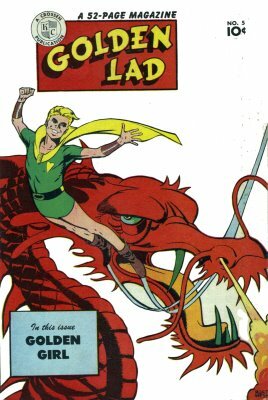 One of the few Golden Age teen heroes both with his own comic book and not an established hero's sidekick, Golden Lad had a five-issue run in 1946-47 featuring art by comic art legends Jerry Robinson (who created Batman's foe, The Joker) and Mort Meskin ! The Heart of Gold had been empowered by "the blood of a thousand martyred Aztecs" to grant power to anyone who fought for justice. Holding the artifact and saying its name, Tommy was transformed into Golden Lad, with the abilities of flight, super strength, and size-changing. Trivia: unlike the Golden Age Captain Marvel , who changed from a kid into an adult hero when he said "SHAZAM! ", Tommy still looks like his teenage self as Golden Lad, just in green tights, yet no one who knows him as Tommy recognizes him when he's Golden Lad! Go figure! As part of our Lost Heroes of the Golden Age of Comics™ line, he's one of the more obscure characters since he hadn't been revived since 1946 until Alex Ross brought him back for a cameo in the first Project SuperPowers mini-series! Digging thru the Atomic Kommie Comics™ archives, we found all five issues, and decided on the three best covers (including the first and final ones) for Golden Lad, giving him his own section for his collectibles! If you're looking for a kool, affordable, Golden Age comic collectible for your pop-culture-fan loved one, you can't go wrong with a Golden Lad goodie (unless you happen to find the Heart of Gold in an antique shop)! Call Her Miss Masque...Call Her Masquerade! The Coming of...the Purple Claw! Fear the Fury of...Miss Fury! Fly the Halloween Skies with Sky Wizard! How Do You Spell "Adventure"? H-A-Z-Z-A-R-D!!! Video Fridays: THE GREEN HORNET in "Crime Wave"